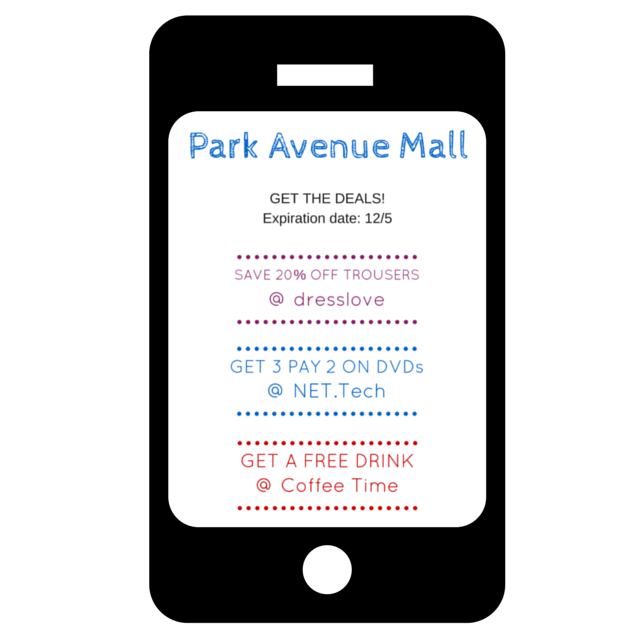 If you are a marketing agency with a focus on the retail sector, or if you are a solution provider willing to add WiFi-based marketing services to your product portfolio… you may be interested in reading this best practice, about how to configure a Wi-Fi network to distribute discount coupons to the Wi-Fi users in a shopping mall. The offers are valid for the whole week. Offer free Wi-Fi Internet connectivity to the mall’s guests. They will be able to authenticate through Facebook or Twitter. If you want to increase your Facebook reach, ask for a “Like” after the login. CONFIGURATION. Captive portal + Tanaza built-in splash page. Facebook Login enabled. Build a very easy landing page with the images of the three coupons. People can download the images or save the whole page to access the content later. You can also add to this landing page the social sharing buttons and the “forward to a friend” button. Track visits on your landing page by using a Google Analytics tracking code. CONFIGURATION. In the Tanaza Cloud Dashboard, set your landing page as the page to which the user is redirected after the authentication. Advertise your offers. Simply create a short video “Free Wi-Fi and discounts for you!” or a simple image ADV announcing that some special discounts are offered to people connecting to the Wi-Fi. CONFIGURATION. In the Tanaza Cloud Dashboard, select your video and image advertisement. The advertisement is shown before the Wi-Fi splash page. How many people did connect to the Wi-Fi network? How many of them were new visitors, how many were the returning ones? How many new email addresses and telephone number did I get? Which target do they represent? How many of them are women, men? Chidren, adults? Where do they come from? How many Facebook Likes did I get? Are the offers right for the target? How many people did use the discount coupons they got? Adjust the offers to fit the target. Analyze your users. Try with a different copy. Change the offers in your landing page once a week, and compare the results of the campaigns.